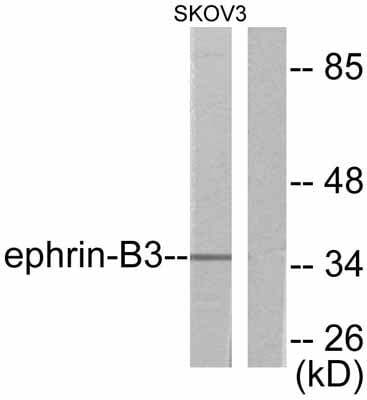 This antibody detects endogenous levels of total Ephrin B3 protein. A synthesized peptide derived from human Ephrin B3. Our Abpromise guarantee covers the use of ab53063 in the following tested applications. WB 1/500 - 1/1000. Detects a band of approximately 36 kDa (predicted molecular weight: 36 kDa). 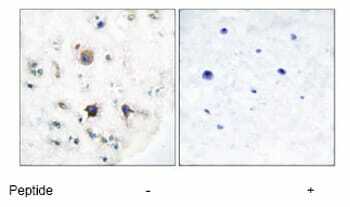 Immunohistochemical analysis of paraffin-embedded human brain tissue using ab53063 at a 1:50 dilution. Right image treated with peptide. 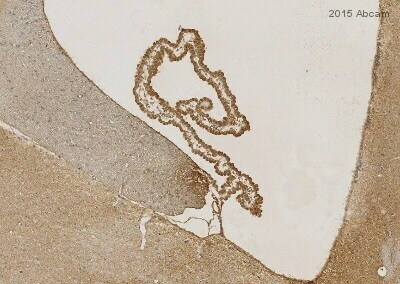 ICC/IF image of ab53063 stained SKNSH cells. The cells were 4% formaldehyde (10 min) and then incubated in 1%BSA / 10% normal goat serum / 0.3M glycine in 0.1% PBS-Tween for 1h to permeabilise the cells and block non-specific protein-protein interactions. The cells were then incubated with the antibody (ab53063, 10µg/ml) overnight at +4°C. 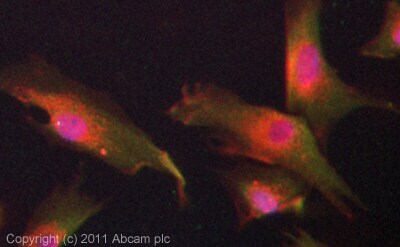 The secondary antibody (green) was ab96899 Dylight 488 goat anti-rabbit IgG (H+L) used at a 1/250 dilution for 1h. Alexa Fluor® 594 WGA was used to label plasma membranes (red) at a 1/200 dilution for 1h. DAPI was used to stain the cell nuclei (blue) at a concentration of 1.43µM. ab53063 has not yet been referenced specifically in any publications. Publishing research using ab53063? Please let us know so that we can cite the reference in this datasheet.